Royal Vegas Casino $1200 Bonus 18+. T&C's Apply. It’s time to take to the skies to protect the innocent from the terror of the sky pirates. We’re not sure if sky pirates were ever a thing, but now we find ourselves wishing they were after seeing something like this. Agent Valkyrie is a slot, however, so there’s not much in terms of expanding on the theme, beyond some neat flyovers of planes and the general concept itself. Still, there’s no denying that the visuals are neat, lending itself to a nice visual style. We quite like the look of the sky. The unique icons certainly do the trick when it comes to giving gamblers a nice looking game. 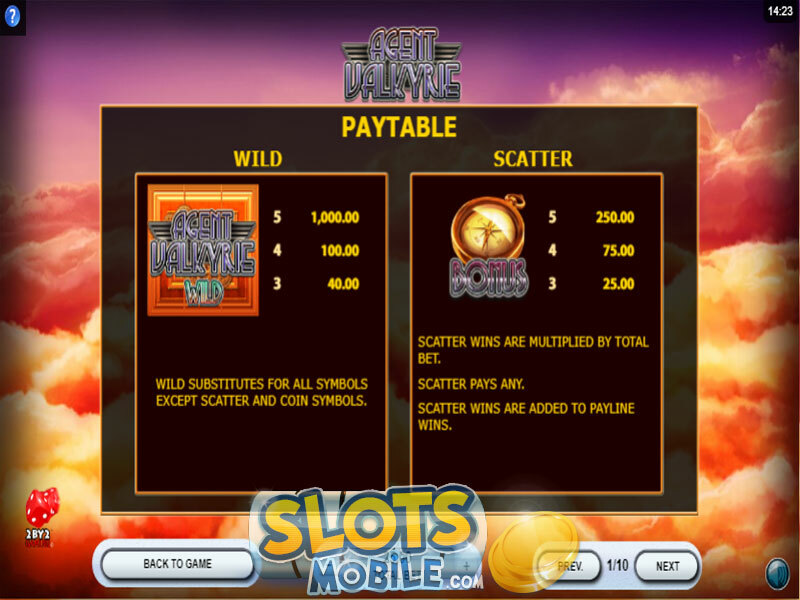 On the gameplay end, Agent Valkyrie offers gamblers a 5×3 playing field and 25 fixed paylines. 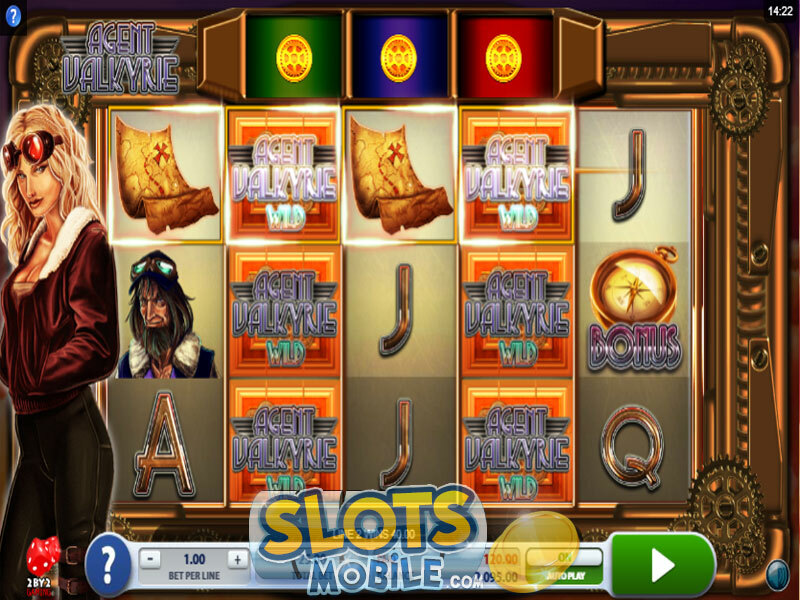 The slot also offers several special features, including a free spins one, but what really sets it apart from most other titles is the player choice that’s given while still giving you a sense of progression. The first bonus has you collecting three coins in a single reel. They carry over into other spins, and are not shared. Each of the three reels has its own bonus to reward once you reach three coins on them. It gives a sense of progression and something to work towards, and it lets you sample the features outside of the free spins bonus. The free spins are triggered by landing three or more Scatters, which gives a small cash payout and between seven to fifteen free spins. You can choose the title to randomly assign you the same three bonuses from the first special feature, or you can assign which of the bonuses will appear during your free spins. So, if you have a favourite that keeps working out for you, or if you want to ensure a nice mix of all three special features, you can set things up to your liking. While we overall like the visuals, we feel like it’s a slightly missed opportunity. Each symbol is well animated and particularly the transitions into special features feel really smooth to watch, not to mention the quality of the symbols on offer, as well. The one thing we can complain about is the inclusion of numbers and letters which feel out of place and the fact that there is a gorgeous skyline backdrop you can see in the menu, but not during the spins themselves. We feel like seeing the open sky would have been a much better choice than a solid background. It’s not all about the visuals, however. Agent Valkyrie is enjoyable, but seems to try to sit in two chairs at once. On one hand, it gives player choice during the free spins, allowing you to set up how you want to outline the three special features that are available to you. On the other hand, it also tries to pull off a progression system that keeps you spinning for longer trying to get three coins in the correct reel. While they’re not mutually exclusive, these two features do seem a bit unconnected. We feel like it would have been better to just collect three coins and then pick which of the three features you would have liked more. There’s no progressive jackpot in the Microgaming’s release, as instead, all your wins will go through the base gameplay or during the features. And it’s no surprise that features really seem to bring out the bigger wins in this game. While the free spins are the absolute winner of the three bonuses you can win during the main game, we had the most luck with Wild Reels. You can play Agent Valkyrie for $0.25 up to $25 per spin. Collecting three coins on the second reel rewards Wild Reels. For one re-spin, one or two reels will turn entirely Wild. Collecting three coins on the third reel rewards Flying Wilds. For one re-spin, a plane will fly across the reels, placing random Wilds on its path. Collecting three coins on the fourth reel rewards Capture Criminals. For one re-spin, all criminal symbols turn into Wilds. All Slots Casino $500 Bonus 18+. T&C's Apply. 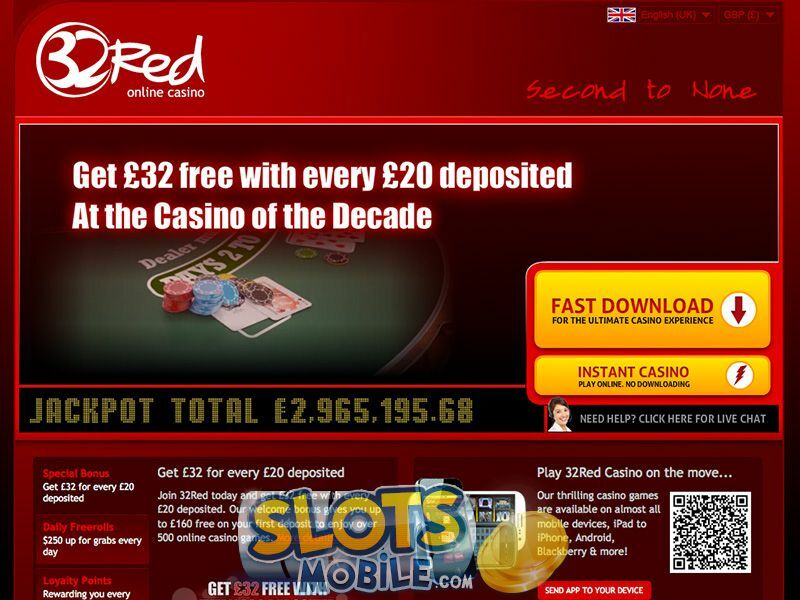 32Red Casino $160 Bonus 18+. T&C's Apply.